Former Senator Juan Ponce Enrile said that when the country is confronted with the same magnitude of rebellion as during the martial law regime, it must be handled intensely. This is to silence or intercept the chaos at once. He retains that the ultimate purpose of the late President Ferdinand Marcos’s military rule declaration was to prevent massive bloodshed. He admits, however, that there were lapses in his memory. This was when he threw a challenge to give him at least one name who was imprisoned because of his or her political beliefs during his interview with Bongbong Marcos. He then insisted that they were released right away as things settled down. At 94 years old, Enrile is running again for Senate seat in 2019. 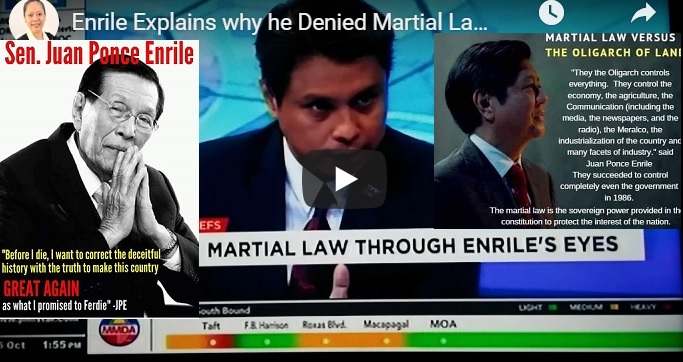 [VIDEO]: The Chiefs grilled former Senator Juan Ponce Enrile on why he told Bongbong Marcos that there were no martial law human rights violations. Former Senate President Juan Ponce Enrile vies for a Senate seat again. This is in the upcoming midterm elections. The 94-year-old veteran politician confirms that he is set to run as an independent candidate. His lawyer, Joseph Sagandoy filed his certificate of candidacy. He urges The Chiefs to let the people judge him on his performance. If he loses, he will easily accept. But he wins, he will serve the nation. History Revisionism or the Truth? “I am not going to wrestle with anybody physically, I am going to wrestle mentally,” Enrile said. Enrile’s Senate bid comes barely a month after he drew flak for his interview with former Senator Bongbong Marcos over what his critics branded as an attempt at historical revisionism of the martial law era. Enrile said that he is running following his own will. Marcos never made an attempt to convince him to re-enter politics. A former defense minister of the late Marcos, Sr., Enrile recently told Marcos, Jr. that no one was arrested under his father’s rule for their political or religious beliefs. Many political figures debated on these and he agrees that he may have said that when having some memory lapses. He also sought to dispel talk that he was no longer fit to run for public office. Enrile said in jest that he may even outlive some of the incumbent Senators. Enrile earlier said he would run as an independent candidate but would welcome the endorsement of President Rodrigo Du30. He said winning in next year’s elections would help him have a platform for his ideas. Enrile joins the late President’s daughter, Ilocos Norte Gov. Imee Marcos in the 2019 senatorial race. It is obvious that The Chiefs are worried about the increasing popularity of Gov. Marcos. The possibility of her brother’s VP electoral protest is another thing. However, Enrile can only advise them to let the people decide.